A hat is an easy project for beginners. It's a good project to practice using both a circular knitting needle and double-pointed needles. You can spend a few evenings knitting in front of the television or during a long car trip and soon have a warm, attractive hat to wear yourself or give as a gift. You can use worsted or bulky weight yarn for this project. 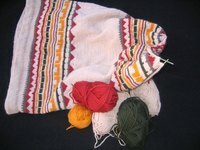 Choose a washable fiber such as acrylic or a wool blend. Cast on 84 stitches using the circular needle. This hat is very stretchy, so your gauge isn't a big concern here. Place a marker and join the stitches, being careful not to twist the stitches. Purl 2, knit 2 around. Repeat this pattern until the ribbing measures approximately 10 ½ inches. Decrease for one row as follows: Purl two together, knit two. Repeat this pattern all the way around. Purl one, knit two for the next few rows until you've knit another inch. Purl one, knit two together all the way around. Switch to double pointed needles. Divide the remaining stitches evenly among three of the needles. Use the fourth needle to purl one, knit one all the way around. Knit two together. Repeat all the way around. Cut the thread, leaving about 12 inches. Thread the end through the darning needle and weave the needle through the remaining stitches, removing each stitch from the knitting needles as you thread the stitch onto the darning needle. Pull the thread to gather the stitches tightly. Secure the end of the thread with a few stitches on the wrong side of the hat. Cut off the excess thread. Weave in any thread ends, using the darning needle to hide the threads among your knit stitches. Fold up the bottom 4 or 5 inches of the hat to form a decorative cuff. Add a decorative pom pom to the top of the hat if you like.